She was born in Nanterre, France and moved to Paris after encountering Germanus of Auxerre and Lupus of Troyes and dedicated herself to a Christian life. In 451 she led a “prayer marathon” that was said to have saved Paris by diverting Attila’s Huns away from the city. When Childeric I besieged the city in 464 and conquered it, she acted as an intermediary between the city and its conqueror, collecting food and convincing Childeric to release his prisoners. Her following and her status as patron saint of Paris were promoted by Clotilde, who may have commissioned the writing of her vita. This was most likely written in Tours, where Clotilde retired after her husband’s death, as also evidenced by the importance of Martin of Tours as a saintly model. Though there is a vita that purports to be written by a contemporary, Genevieve’s history cannot be separated from her hagiography. She was described as a peasant girl born in Nanterre to Severus (a Romanized Frank) and Geroncia (Greek origins). On his way to Britain, Germanus of Auxerre stopped at Nanterre, and Genevieve confided to him that she wanted to live only for God. He encouraged her, and at the age of fifteen, Genevieve became a nun. On the deaths of her parents, she went to live with her godmother Lutetia in Paris (“Lutetia” was the former name of the city of Paris, so this has symbolic weight.) There the young woman became admired for her piety and devotion to works of charity, which included corporal austerities, and a vegetarian diet which allowed her to have supper but twice per week. “These mortifications she continued for over thirty years, till her ecclesiastical superiors thought it their duty to make her diminish her austerities.” She encountered opposition and criticism for her activities, both before and after she was again visited by Germanus. Geneviève had frequent visions of the saints and angels. She reported her visions and prophecies until her enemies conspired to drown her in a lake of fire. Through the intervention of Germanus, their animosity was finally overcome. The Bishop of Paris appointed her to look after the welfare of the virgins dedicated to God, and by her instruction and example, she led them to a high degree of sanctity. Shortly before the attack of the Huns under Attila in 451 on Paris, Genevieve and Germanus’ archdeacon, persuaded the panic-stricken people of Paris not to leave their homes and to pray. It is claimed that the intercession of Genevieve’s prayers caused Attila’s army to go to Orléans instead. During Childeric’s siege and blockade of Paris in 464, Geneviève passed through the siege lines in a boat to Troyes, bringing grain to the city. She also pleaded to Childeric for the welfare of prisoners-of-war and met with a favorable response. Through her influence, Childeric and Clovis displayed unwonted clemency towards the citizens. Clovis I founded an abbey where Genevieve might minister, and where she was later buried. Under the care of the Benedictines, who established a monastery there, the church witnessed numerous miracles wrought at her tomb. Genevieve was canonized, and the church was rededicated in her name; people eventually enriched the church with their gifts. It was plundered by the Vikings in 847 and was partially rebuilt, but was completed only in 1177. In 1129, when the city was suffering from an epidemic of ergot poisoning, this “burning sickness” was stayed after Saint Genevieve’s relics were carried in a public procession. 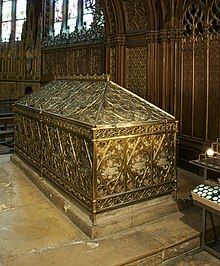 This was repeated annually with the remains being brought to the cathedral; Mme de Sévigné gave a description of the pageant in one of her letters. The relief from the epidemic is still commemorated in the churches of Paris. After the old church had fallen into decay, Louis XVordered a new church worthy of the patron saint of Paris; he entrusted the Marquis of Marigny with the construction. The Marquis gave the commission to his protégé Jacques-Germain Soufflot, who planned a neo-classical design. After Soufflot’s death, the church was completed by his pupil, Jean-Baptiste Rondelet. The Revolution broke out before the new church was dedicated. It was taken over in 1791 by the National Constituent Assembly and renamed the Panthéon, to be a burial place for distinguished Frenchmen. It became a famous monument in Paris. Though Saint Genevieve’s relics had been publicly burnt at the Place de Grève in 1793 during the French Revolution, the Panthéon was restored to Catholic purposes in 1821. In 1831 it was secularized again as a national mausoleum but restored to the Catholic Church in 1852. Though the Communards had dispersed the relics, in 1885 the Catholic Church reconsecrated the structure to St Geneviève. Today, the Panthéon serves both religious and secular functions.